These are handmade, free form art switch plates, so that all are unique art. The story behind the single art switch plates. Red & green images on foil art light switch plate cover: This light switch plate cover has a pale yellow foil base coat. After firing the base coat, a black enamel is sifted over the entire switch plate, then pushed around to create the outline for the images. The next two to three firings involve adding the reds, oranges, yellow and green; for each firing, most colors are a combination of two to three colors. 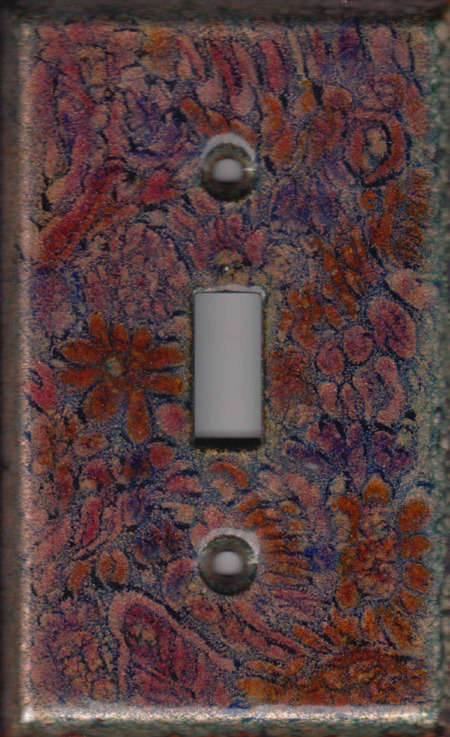 Images with red, pink & purple art switch plate: This light switch plate cover has a pale yellow foil base coat. After firing the base coat, a transparent dark purple enamel is sifted over the entire switch plate, then pushed around to create the outline for the images. The next two to three firings involve adding the reds, pinks and purple for each firing, most colors are a combination of two to three colors. 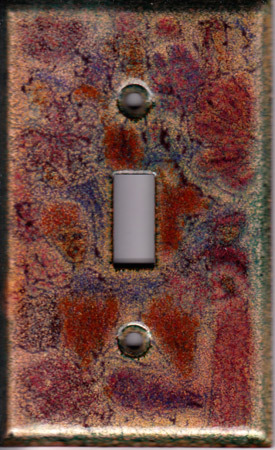 Purple red & orange striations on foil art switch plate: This light switch plate cover has a pale yellow foil base coat. After firing the base coat, a black enamel is sifted over the entire switch plate, then pushed around to create images in a striated style. The next two to three firings involve adding the reds, oranges, yellow and purple; for each firing, most colors are a combination of two to three colors. Images in reds and orange on foil art switch plate: This light switch plate cover has a pale yellow foil base coat. After firing the base coat, a black enamel is sifted over the entire switch plate, then pushed around to create the outline for the images. The next two to three firings involve adding the reds, oranges, purple and pink; for each firing, most colors are a combination of two to three colors. Striated black images on foil art switch plate: This light switch plate cover has a pale yellow foil base coat. After firing the base coat, a black enamel is sifted over the entire switch plate, then pushed around to create the outline for the striatedl image style, more black is added to areas to create darker and lighter tones for emphasis. 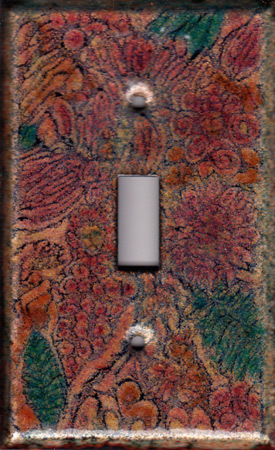 Autumn color images on foil art switch plate: This light switch plate cover has a pale yellow foil base coat. After firing the base coat, a transparent dark purple enamel is sifted over the entire switch plate, then pushed around to create the outline for the images. The next two to three firings involve adding the reds, orange and purple for each firing, most colors are a combination of two to three colors. 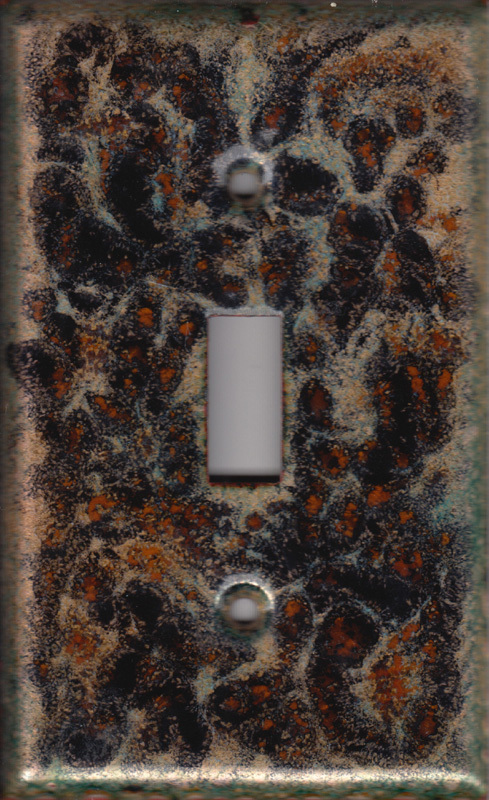 Black images with orange art switch plate: This light switch plate cover has a pale yellow foil base coat. After firing the base coat, a black enamel is sifted over the entire switch plate, then pushed around to create the outline for the striatedl image style, more black is added to areas to create darker and lighter tones for emphasis, and orange is added in places. Purple pink & orange images on foil art switch plate: This light switch plate cover has a pale yellow foil base coat. After firing the base coat, a black enamel is sifted over the entire switch plate, then pushed around to create the outline for the images. The next two to three firings involve adding the reds, oranges, yellow, pink and purple; for each firing, most colors are a combination of two to three colors. 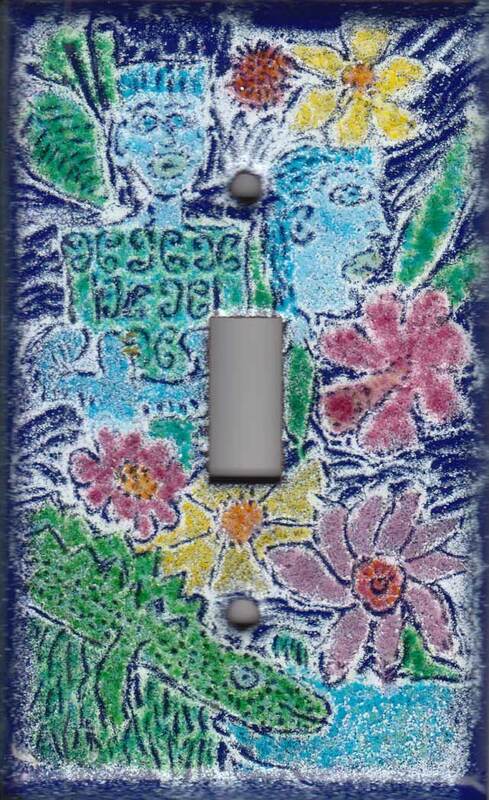 White images on blue velvet art switch plate: This light switch plate cover has a rich sparkly blue base coat that looks like blue velvet. Next a white enamel is sifted over the entire switch plate and pushed around to create the images. 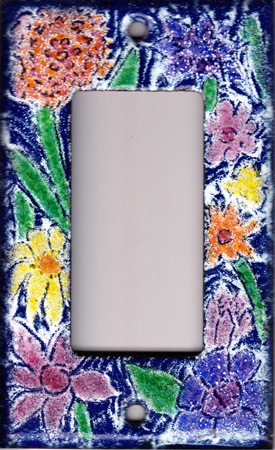 White images on black art switch plate: This light switch plate cover has a thin black base coat. Next a white enamel is sifted over the entire switch plate and pushed around to create the images. Red & Blue Images on White art switch plate: This light switch plate cover has a white base coat. 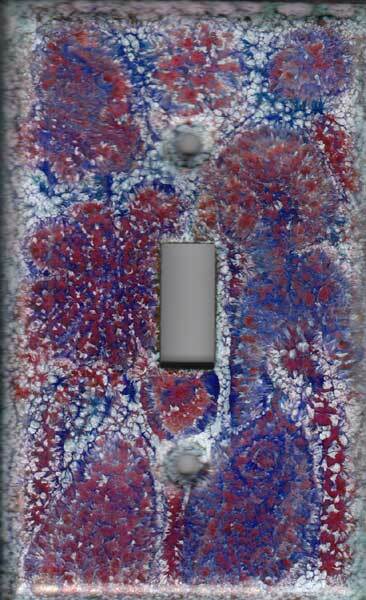 Next a transparent purple enamel is sifted over the entire switch plate and pushed around to create the images. Next the reds, blue and purple colors are added with two more firings. 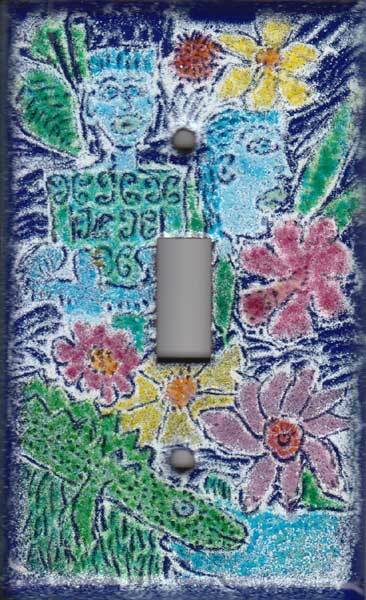 Flowers on Cobalt Blue art switch plate: This light switch plate cover has a blue base coat. Next an opaque white enamel is sifted over the entire switch plate and pushed around to create the images. Next the pink, yellow, purple and green colors are added over the white images with two more firings.